The automatic bypass valve regulates the central heating systems differential pressure. 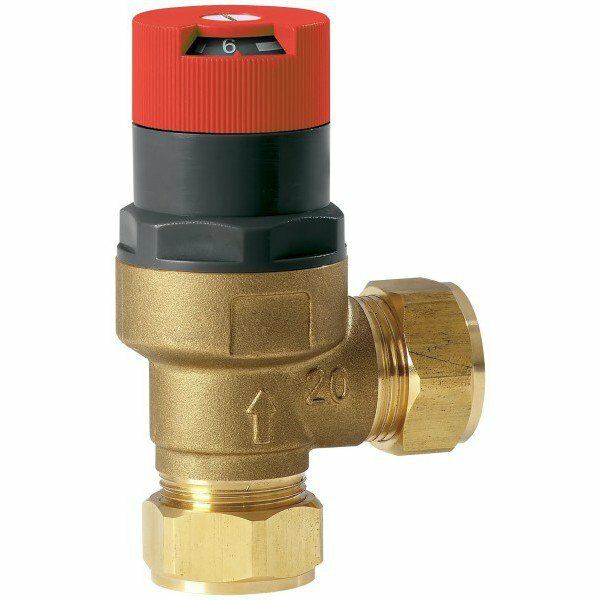 The 22mm valve should be fitted where a boiler bypass is required – typically this is the case when a system is equipped with thermostatic radiator valves (TRV’s), and to allow pump overrun operation after the zone valves have closed down. TRV’s slowly close down as each radiator raises the room temperature. To overcome flow restrictions as TRV’s close down, the bypass valve is adjusted to the required set point. As the system resistance increases due to TRV’s closing, the bypass valve allows flow to increase in order to maintain the required pre-set system differential pressure. The regulation provided will reduce system noise that can result from TRV’s or zone valves closed, eliminate pump impeller wear that can result from high flow resistance and enhance the life of the boiler’s heat exchanger by ensuring minimum flow rate at all times. Installation should be in a loop between flow and return after the pump. Ensure that the flow is in the direction of the arrow on the valve body. Rotate the adjustment head until the required setting number is visible, and lock the valve at that point by tightening the screw on top of the adjuster.